The NWSL spatula/trophy will be delivered on Saturday afternoon to either the reigning 2017 NWSL Champion Portland Thorns OR to the 2017 runners-up and 2018 winners of 17 regular season games (not to mention the 2018 International Champions Cup Tournament Champs), the North Carolina Courage. I (Kevin) will be at the match with photographer Amy Pearson (@bdzsports), so check the ‘ol social media for plenty of goodness. A year ago in Orlando we got the same matchup. And it’s tempting to think that the 2018 showdown will deliver similar results (hopefully without all the injuries and violence). But these are two very different teams when compared to last year. They’re both better than their 2017 incarnations. The loss of Amandine Henry was a big blow for the Champions. Her vision and passing connected the midfielders to one another and the midfield to the forwards with what often looked like effortless ease. 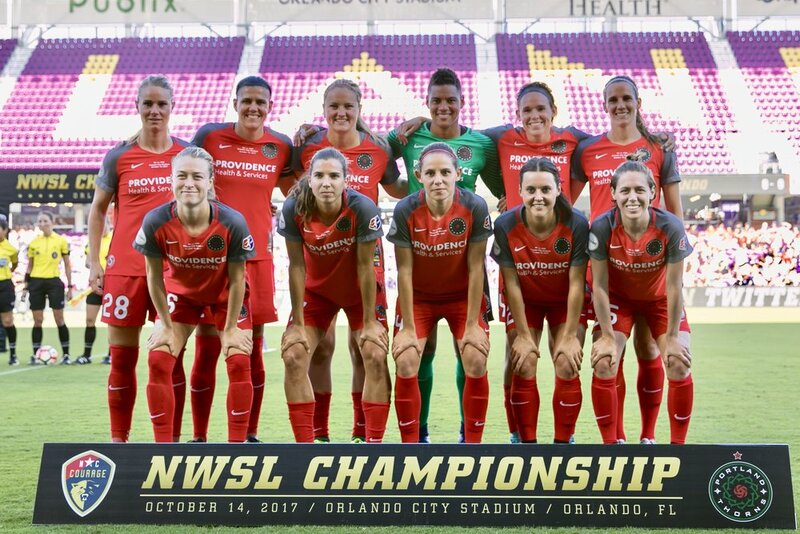 During the first third of the 2018 season, the Thorns were a shell of themselves, winning only two games out of eight. They had injuries at several positions and were trying to get new players involved to make up for what they were missing. It didn’t always work. 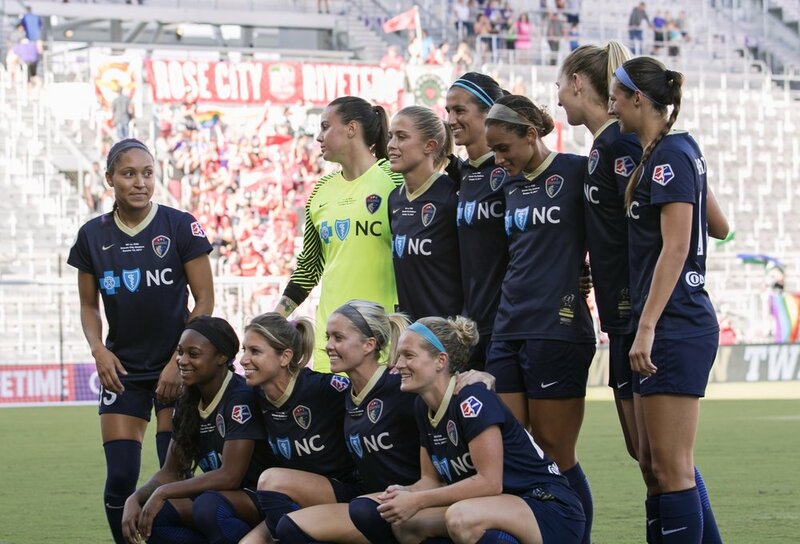 One low point had to be the 4-1 home drubbing suffered at the hands of their only remaining 2018 opponent, the NC Courage. Despite the joy of seeing Kat Reynolds score her first league goal in her 100th league game, the four goals surrendered, including three that came in a particularly bleak 7-minute stretch, made for a long night for home fans in Providence Park. The next week, they could only draw at Chicago before finally getting a feel-good win at Houston. They followed that up by allowing the league’s worst team to hold them to a 1-1 draw at home before a quick trip to Seattle to lose to the Reign. But once July started, the Thorns woke up and started to look like their dangerous best. 4-0 winners over Utah. 3-1 winners over Houston. A 2-1 win away at Sky Blue for a bit of revenge. But time and again, it’s been the Courage that have stopped the Thorns momentum. The Thorns lost 1-0, 4-1 and 2-1, with the worst performance being the one at home. They’ve just had trouble breaking down the Courage. If you were picking a winner for teams who have a 7 goals to 2 aggregate scoring record head-to-head for the year, would you even think twice? After losing the 2017 Championship to the Thorns, the Courage went back to work to make sure that history would not repeat itself. They handed Portland three losses head-to-head on their way to 17 regular season wins. Only the Utah Royals gave them trouble, stepping in their path to hand them their first draw and their only loss of the year. Utah won the season series with the Courage, earning 5 points to NC’s 2. But after that home loss on June 16th, the Courage started scoring crazy goals. 4-1 at Seattle. 3-0 at Orlando. 4-1 at home vs Chicago, 2-0 at home vs Washington, 4-0 at Sky Blue. Ouch. Then, again, the Royals held them to a scoreless draw. They responded by beating the Thorns at home 2-1 in their next match. Every time they’ve faced a challenge, they’ve found a way past it. Every time they’ve had a setback, they’ve responded with resolve and victory. Surely they’ll have a plan for Portland. Both sides will be without a couple of pieces that have played major roles for them this year. For the Thorns, it’s Katherine Reynolds and Hayley Raso. For the Courage, it’s McCall Zerboni (who will not even be able to attend the match as she continues to recover from elbow surgery). North Carolina also continues to list Katelyn Rowland (concussion) and Kristen Hamilton (left quad strain) as questionable. Rowland sat out Tuesday’s semi-final, and Sabrina D’Angelo filled in by making several saves and keeping a clean sheet. Hamilton was a late sub for the Courage, so unless she aggravated her injury, she’s likely to be available. One element of the match that can’t be ignored is the massive, passionate Thorns fanbase that is all but certain to deliver a record crowd to Providence Park. They’ll be loud for the duration. They’ll boo Jaelene Hinkle every time she touches the ball. They’ll lift their Thorns up if the team needs a spark. And, they’ll undoubtedly provide an incredible and inspiring sight to the TV audience. With any luck at all, the fervor and excitement of this match will encourage season ticket sales across the league so that more teams will have the opportunity to experience the type of home support in ever larger numbers that the Thorns regularly enjoy. This game can easily go to either team. It’s easy to imagine North Carolina scoring early, then being unable to withstand the fight-back from the Thorns. It’s equally easy to imagine the Thorns grabbing the first goal, only to have the Courage draw level and go ahead in rapid succession. Which side will allow a tiny sliver of doubt take hold? Which side will start being just a tad careless in possession? Which side will retaliate for an uncalled foul? Which side will lose, if only for a second, the laser focus on winning and allow themselves to be drawn into the type of game that the other team wants to play? I think North Carolina’s season-long consistency will give them the edge they need to win this game, even on short rest, and even in Providence Park. The loss of the home playoff game due to Hurricane Florence, and having to play both Tuesday and Saturday will fit neatly into Paul Riley’s pregame underdog narrative team speech, which has certainly seemed to work so far. If Portland can’t find a way to be level at the half, they’re likely to start pushing and being exposed on the counter. The only sure way to avoid Lindsay Horan and Tobin Heath is to just punt the ball past them. That’s also one sure way to get Lynn Williams, Crystal Dunn and Jess McDonald jetting towards AD Franch’s goal. Sam Mewis’ stunning goal from Tuesday was nothing if not a statement that she’s back to 100%. All those parts feel like they may be just a bit too much for the Thorns, home or not. I’m going to pick the Courage in a close one. This one mercifully gets a resolution in regulation, and the Courage break the Shield Curse with their 4th win of the year over the Thorns.